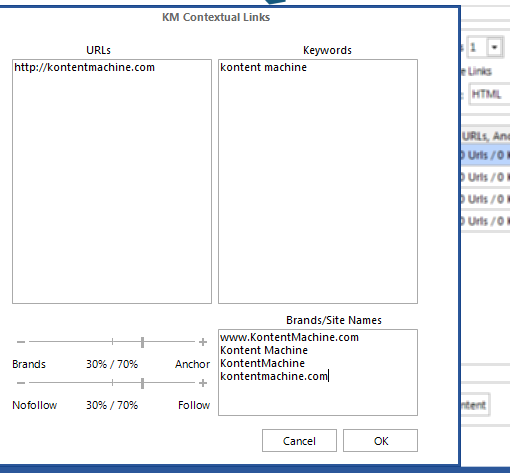 In this tutorial, you will learn about the different types of links you can add with Kontent Machine. 1. Contextual Links. As the name suggests, Kontent Machine will hyperlink your keywords in the articles in such a way that they will not break the content flow (unless you change the keyword, of course). 2. 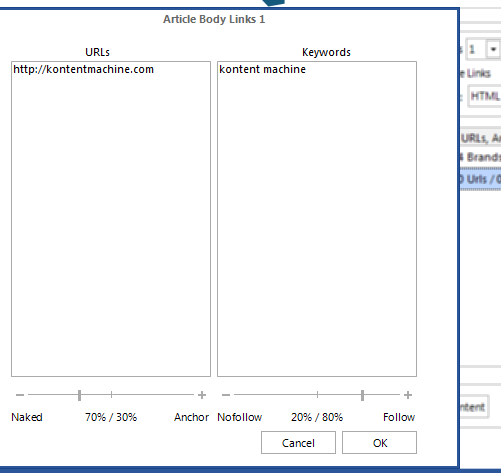 Article Body Links. These are separated pieces of anchor text. You can place them either between paragraphs or set them to mimic contextual links. What this means is that they will be inserted into sentences. 3. Resource Box Links. These are the links in the resource boxes or “about me” snippets. 4. Activate Image Links. If you enable them, Kontent Machine will hyperlink the images in the articles. 1. Brand/Site Names. Here you can type your domain names, brands or just URLs. If you are browsing websites for seo tools you will find hundreds among which is Kontent Machine. People say kontentmachine.com has nothing to do with seo tools but that is not entirely true. Kontent Machine first drew my attention a couple of months ago when I was searching for seo tools. 1. Naked vs. Anchor. This is the mix ration between anchor text and naked URLs used. 2. Nofollow vs. Follow. Just as with contextual links you can adjust now many of the links will be marked as follow and how many not. By left clicking under Location, you can select the placement of the selected link set. If you tick the check box under Token, you will turn the link into a token. That is pretty useful since some submission software relies on such. 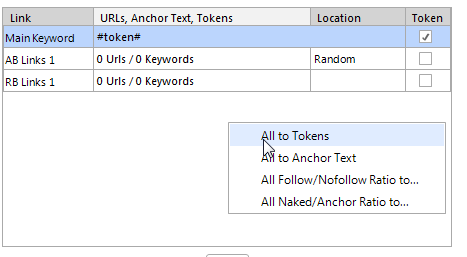 Just click in the Anchor Text column and type the token.